As fall’s chill descends on your chickens, make sure to perform these winter-prep chores to keep your flock safe and warm. 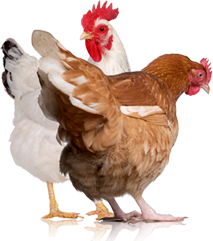 Before winter comes, perform a number of coop chores, including cleaning the bedding, checking for predators, and heating and ventilating the coop. When the days grow shorter and autumn’s brisk entry turns leaves colorful and crisp, dipping temperatures mean it’s time to think about preparing your chicken coop for the winter. Because most backyard chickens live outside, exposed to the elements’ cool chill, you need to provide a clean, cozy and draft-free coop for them. Your specific chores—and when you do them—will vary, depending on where you live. In the Pacific Northwest, for instance, temperatures rarely reach below 20 degrees F, so chicken keepers have no need to pull out the water-bucket deicers or heat lamps. In the chilly Midwest, however, where winter temps regularly plunge into negative digits, more sophisticated chicken-warming tactics are necessary to prevent cold-weather threats, such as comb or wattle frostbite. No matter where you call home, you will have chores that need to be done. If possible, choose a warm, clear-sky day to accomplish the tasks outlined below. Happy winter prepping! Before you dive into bedding cleanup, first remove all your coop’s movable furniture and accessories and stow them where you can scrub them later. These pieces include things like your flock’s feeding and watering bowls, grit holder, roosts, nesting boxes and dust-bath box. They’ll likely be soiled and stained and in need of some good elbow grease. To clean them, hose down surfaces and use a sharp-edged scraper to remove stuck-on droppings. Then, using steel wool or a plastic pot scrubber and some commercial or homemade cleaner (like a 50/50 vinegar-to-water solution), clean the accessories and inspect them to be sure they’re in good working order. Rinse well, leave them in the sun to dry, and return them to the coop when your other chores are complete. Although manure might heat up your chicken coop, plan to perform a good coop cleanout before cold temperatures settle. Unlike during spring cleanup, when you thoroughly remove all the chicken manure and scrub the coop from cupola to floorboard, your fall chores won’t be quite so all-encompassing. Instead, your goal will be to freshen up what’s there. Plan to remove damp bedding around doorways and water dishes, loosen the litter to promote moisture-wicking airflow, and add another clean layer of bedding on top. Gather your cleanup supplies, including a wheelbarrow or bucket, a trowel or shovel, a pitchfork and some fresh bedding. Coax the ladies out of their coop and into their run with a little scratch. Using your trowel or shovel, scoop damp bedding into the wheelbarrow and transport it to your compost pile. Next, move your pitchfork or rake through the existing litter, aerating it. 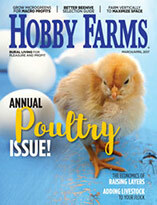 Finally, toss some fresh, chicken-safe wood shavings or hay on top, freshening the coop and absorbing lingering odors. To make sure your coop will survive the winter winds and precipitation, visually inspect the structure for overall integrity. Look at the coop’s base, legs and ramps. Are they solid and secure? Check the building’s interior and exterior for loose boards, protruding nails and large draft holes, repairing them as necessary. Examine the coop’s doors, including the nest-box doors and hatches. Are the hinges screwed in tight? Do your hooks and locks work properly? If not, now’s the time to fix them. Another important chore to check off before wild weather begins: Make certain your coop’s roof is sound- and water-tight. If your roof has shingles, check for missing tiles and replace them. If you have a plywood or metal roof, make sure it’s securely nailed down. Clean out gutters, if need be. And if you have a tarp covering your coop or run, inspect it for rips or holes and lay down a new one, if necessary. While you’re checking your coop’s interior and exterior, you should also look for signs of predators and shore up any varmint protection you have. If you see rat or mole holes around your henhouse, put some hardware cloth across the opening and cover it with dirt. If you’re getting frequent flybys from area raptors, consider deterring them with some high-strung wire adorned with reflective tape or old CDs or DVDs. At this point, you should also check the fencing around your chicken yard. Ideally, your close-mesh fence’s base should be buried, with the bottom 6 to 12 inches bent outward to deter diggers. It should also have no holes or openings for easy predator entry. Though many predators will hunker down for the winter, be prepared for hungry marauds all yearlong. Vents and hatches along a coop’s roof and floorboards assist with airflow during the warm summer months, expunging humid air and toxic ammonia from the henhouse. Although proper airflow is critical during the cooler months, too, you should plan to close extra vents, particularly those that create drafts. When they blow through, the drafts and breezes can replace the air next to a hen’s warm body with cooler air, causing it to chill. When ventilating your coop during the winter, shoot for a humidity level between 40 and 60 percent. Any more than that, and the moisture in the coop could actually be considered a health hazard because a host of viruses and bacteria thrive in moist air. Your chickens won’t likely need an internet connection in their coop. However, they may need access to electricity and running water, particularly in areas that dip into the lower temperatures. Electricity will keep a heat lamp running and a deicer operating, while running water will make filling water bowls easy. To prepare your coop’s electricity and plumbing for the winter, first check your connections. Make sure your electrical outlets are working properly, and your devices’ wires and plugs aren’t frayed or worn. Check your pipe fittings and hose connections, too, ensuring there are no leaks in your lines. And if you live in a frost-prone area, now’s the time to insulate your exposed pipes. After you complete this list of basic winterizing chores, you’ll be well on your way to maintaining a cozy and comfy space for your birds throughout the winter months. It takes some planning and time, but it’s worth it for your chickens’ health and happiness. About the Author: Wendy Bedwell-Wilson lives on an 80-acre farm in southwestern Oregon. 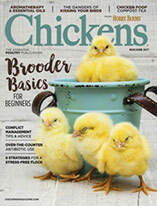 This article originally appeared in the Fall 2011 issue of Chickens. Author of nine books and hundreds of articles, Wendy Bedwell Wilson has been a freelance writer and editor for 12 years. She writes about pets, farming and healthy living from her 80-acre hobby farm in southwestern Oregon, which she shares with her husband, three rescued dogs—a retired racing Greyhound named Song, a hound mix named Pete, and a Chihuahua mix named ChiChi—a feline mouse hunter called Cleo, and a barnyard of farm critters.